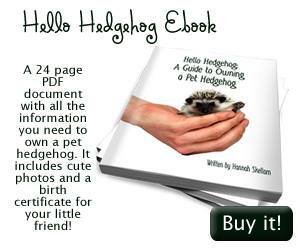 The first step in caring for your hedgehog is to register with a vet who specialises in exotic animals. Don’t wait until you need a vet before you sign up with one! You should also find an 24 hour emergency vet just incase your pet hedgehog gets injured or very sick in the middle of the night. A hedgehogs spikes are known as his quills. 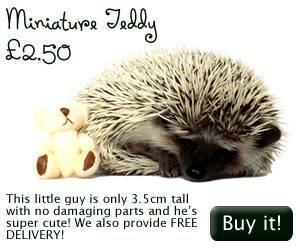 Between the ages of 8 – 12 weeks old your hedgehog will go through a phase called quilling. This is when his quills fall out and his new ones grow. You will know this is happening as you will find quills in his bedding. During this period (which can last a week to a month) your hedgehog may be a little itchy, moody and sensitive to being touched. A way to help sooth it’s skin is to give it a bath. Hedgehogs don’t need baths often but they will if they have faeces on their feet and it can help them when they’re quilling. To sooth their skin you can use Aveeno Oil in their warm bath. Don’t ever let the water get up their nose and never leave them unattended in the bath. It is a good idea to have the water pretty shallow (the height of their legs) for their first bath so they are not overwhelmed with the new sensation. Another way to soothe their skin is to put some oats in an old pair of tights and drop it into warm water. It acts like a tea bag and the milky substance that comes out can ease their discomfort. Some pet hedgehogs like a bath, they swim or even float on their back! But some hate it and will never like it. When you’ve finished bathing your little friend you must make sure it is totally dry and warm. A good way to do this is wrap it in a towel and give it a very long cuddle. A damp hedgehog can get ill very quickly so it’s very important to dry it properly. Hedgehogs have pretty poor vision and cannot judge heights, meaning if they’re on a table or countertop, they might just walk of the edge without realising they’ll fall. This can seriously injure them. They do however have a strong sense of smell, taste, hearing and touch. When a Pygmy Hedgehog is scared, worried or feeling threatened it will let you know by snorting, huffing, hissing, lunging/rolling into a ball. Very rarely they will bite. With patience and gentle handling it can be encouraged to relax, uncurl lay its quills relatively flat and meet the person holding it. When they are interested or curious about something they my snuffle and sniff loudly, waddle when they walk and have their nose to the ground or air sniffing out scents. Anting (Self anointing): Anting is a funny looking action that hedgehogs do when they come across a new smell or object. The animal might lick and chew the object until it produces a lot of frothy, foamy saliva and then it spread this saliva over its own quills with its tongue. Sometimes they can fall over while doing this. No one knows exactly why hedgehogs act like this but theories range from cooling down to parasite control to hiding their own scent. Hedgehogs don’t bite very often, if they do it is usually because they think your fingers are food! If this is the case, they will usually start by licking you. If this happens, put them down to avoid being bitten! Your African Pygmy hedgehog will probably defecate and urinate in one area of their enclosure, usually the corner. They also tend to do this when they’re running on their wheel. When hedgehogs get cold, they hibernate to conserve energy. When they hibernate they breathing and heart rate slow down significantly. It is very dangerous to let an pet hedgehog hibernate as it causes stress and can potentially kill your little friend. To prevent your hedgehog from hibernating make sure it is well nourished and living in comfortable temperatures. (75-85F or 24-29C). If this little critter gets too hot it can suffer from stress. Don’t let it be in temperatures over 85F or 29C. They can die from heatstroke. When they’re too hot they pant and stretch out flat on their bellies, trying to cool down. Be particularly careful if you’re transporting your hedgehog, cars can get extremely hot, extremely quickly! Never leave it in a car on its own. Pygmy Hedgehogs can suffer from constipation from time to time. To help your pet you can give them wet cat food (chunks of chicken in jelly) and mashed up canned pumkin/butternut squash. When your pet is content you may hear it making very faint twittering noises. How cute!